Banter often becomes quite heated, usually about the 'right' wood, length, wedges - wood or metal. Ness had been reading lots of posts on Axe Junkies, a group on fb purely about axes & adzes, and was getting worked up about the handle issue. I prefer Ash. Americans use Hickory - don't think they have much Ash. She showed me the various discussions, mostly concerned with twisted grain, grain alignment and all sorts of things that neither of us could fathom out at all. Here in England many folks make their own using green timber but from all those discussions on AJs I realised for the first time that most Americans want to buy their handles in. Ness got a bit of a telling off when she suggested that instead of moaning about all the issues, which she thought were totally irrelevant, considering they were paying peanuts - why didn't they make their own? She was told that there was no hardwood in many areas or the wood available was not straight, those seem to be the main problems and the nitty gritty of the matter. We spent a while looking through loads of boxes of axes but to save space and keep them all stored conveniently in old wooden wine boxes we've removed any handle that were broken, too wormy to be safe or just worn out. Nearly all the ones I use have all had new handles fitted by us in different thicknesses and lengths to suit either the tool or hand sizes from children's to a large bloke's mitt. We've found that whilst buying old axes in East Anglia they often have Willow or Poplar handles. You may well say that's a stupid wood for a tool, specially an axe, but I've notice that there aren't a lot of big Ash trees available for cutting down around Ely. Folks have used whatever is available to them since time immemorial and why not. You need an axe handle, there are loads of willows at the end of your patch - surely you'd use some of that rather than travelling 30 or however many miles it is to say Halstead in Essex where the nearest available Ash is for sale. We also talked about the strength of Willow - after all cricket bats are made from it. You can see what a lovely spring it has, balls are hit mighty distances, they can last for years if looked after and everyone in England recognises that wonderful sound of 'leather on willow'! I've used Poplar for many things including an axe handle. We were doing a workshop in a Poplar plantation in North Essex and a student used an axe as a lever for something or other, the handle snapped. A perfectly good replacement was quickly made from some seasoned stacked poplar and a serviceable wedge from the broken handle. Many of the Bill Hooks I've had pass through my hands have handles made simply from a hedgerow rod of Blackthorn or Hazel. The purists will tell you that Ash is the only suitable timber but when it comes down to it you use what is readily available to hand. 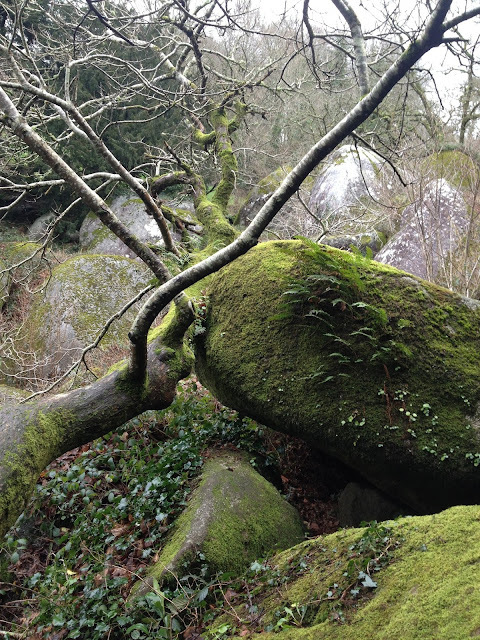 I'd returned from an amazing walk through the woods in Brittany where were staying in a beautiful village for a 2 week holiday and I had to move some gravel as the car kept getting stuck in thick mud in the driveway. The wheel barrow had a puncture, so I used the emergency car tyre repair kit to sort it - you know the one, it should take 5 minutes and ends up taking all morning! The Cooper also offers a full repair service and often replace worn hoops and whatever else needs doing. So on my next visit to La Belle France I'm going to make it a priority to organise a visit to the workshop - very exciting and I'm looking forward to it already. Have been having plenty of chats lately about the tools used for coopering and clogging, this brought to mind my Stock Knife which I used to make tent pegs for a while - I decided that I prefer turning and I'm not really a tent peg maker however much the demand is for demonstrating the skill. I decided to sell it and used FB as my sales place. Terrible mistake - I was inundated with ridiculous messages from the whole world and his wife and couldn't go through them all to sort the wood from the trees! So I ended up doing nothing about it and now 'she who must be obeyed' (if I expect to have home made cakes/bread/biscuits & cordon bleu meals) has mentioned it's been sitting on the dining room table for the last 18 months and should really GO if I don't want it. So I think I'll offer it to all you folks and if your interested perhaps you would send me an email to Robin Fawcett. I'd like at least £175 for it so if you want it make me your best offer and I'll be in touch with you. I bought it many years ago and turned a new handle for it on the Pole Lathe. It's made from beautiful steel and it must have a good carbon content as it keeps it's edge beautifully. Lovely and sharp - I could give myself a perfect shave with it. You can see more of it on YouTube where I've got a film of making tent pegs although I used it mostly to knock out spatulas. One of the main benefits is that you have real leverage when working on those uncompromising bits of timber and of course if you're using a softish wood like Willow, Poplar or Birch it slices them like a knife through butter. I've since decided I really like using my axe more though! This had some of the prettiest leg and stretcher turnings I've seen in a long while. A very satisfying piece of furniture to work on and fairly robust. Interestingly when I had a feel it was obvious that the parts had been made from greenwood, beech and felt noticably oval.